The fort of Jaisalmer is a breathtaking place to visit in Jaisalmer: a massive sandcastle rising from the sandy plains like a mirage from a bygone era. 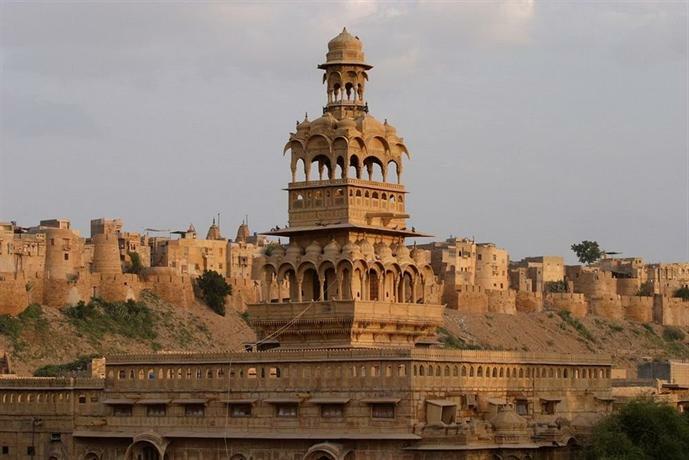 The tourist places in Jaisalmer will give you an experience to be remembered forever. No place better evokes exotic camel-train trade routes and desert mystery. Ninety-nine bastions encircle the fort’s still-inhabited twisting lanes. Inside are shops swaddled in bright embroideries, a royal palace and numerous businesses looking for your tourist rupee. Despite the commercialism, it’s hard not to be enchanted by this desert citadel. 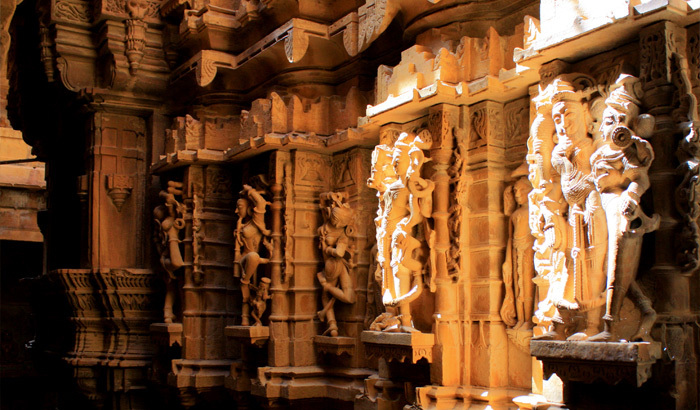 Jaisalmer has been enriched by its Jain community, which has adorned the city with beautiful temples, notably the temples dedicated to the 16th Tirthankara, Shantinath, and 23rd Tirthankara, Parshvanath. 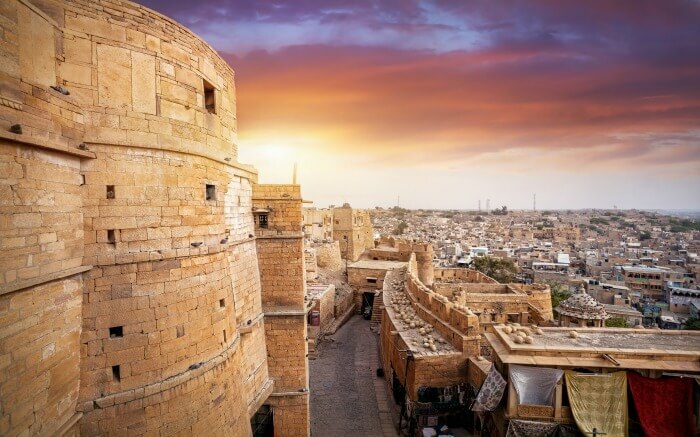 Amongst all the places to see in Jaisalmer, the Jaisalmer Fort is the largest. It is in fact, one of the largest forts around the world. Located on the Tirukuta Hill, this fort was built by Rao Jaisal, one of the mightiest rulers of Jaislamer. Due to its location at the golden stretches of the Thar Desert, this fort is also known as the ‘Sonar Quila’ or the ‘Golden Fort’. Over the past few centuries, this fort has witnessed several battles and has successfully endured its pride and glory of being one of the magnificent forts in Rajasthan. However, kings and battles are no more persistent and can be found on the pages of history books, leaving behind their immortal legacy and bonding with this fort. In addition to the beguiling beauty of the fort, it is also bejeweled with several astounding monuments within it premises. Raj Mahal, Laxminath Shrine, Merchant Havelis, the ornate Jain temples and the gateways are some of the major attractions of this fort. 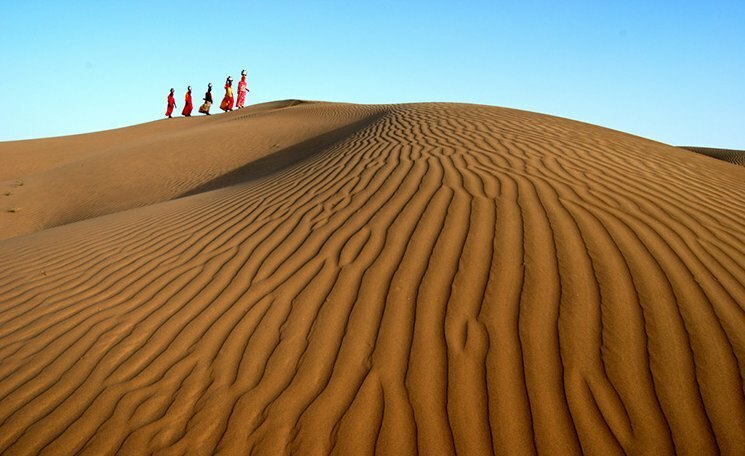 Sam sand dunes are indeed one of the most authentic desert dune sites in whole India and truly deserves to be on your list of things to do in Jaisalmer. Here, you find 30 to 60-meter tall sand dunes and many travellers enjoy Desert Safari on camels or jeep. Sam is 45 kilometres west of Jaisalmer city where you can reach by hiring a vehicle. You may further choose to stay in one of many desert camps that are mostly built in 2 to 3 km radius of sand dunes. The best time to reach Sam sand dunes is around evening to enjoy the desert sunset at around 4 to 7 PM or early morning, during the sunrise time of 4 to 6 am. You can book a camel or jeep well in advance or on the spot as they are also available at desert camps. The best time to visit Sam or even Jaisalmer is from the months of October to March as during the renaming months, all the camps are closed and only few camel riders are made available. Moreover, the evening musical program at Sam at the desert camps are not available in summer and monsoon months. Named after the Maharaja, this reservoir has now earned the fame of being the most popular places to visit in Jaisalmer, and is visited by people from various corners of the world. Located on the outskirts of Jaisalmer, it is an idyllic getaway to seek peace and tranquillity of mind, away from the bustling and chaotic city life. Fringed with several temples and shrines, the lake also serves as an ideal place for the birdwatchers. During the winters, it is flocked by different species of exotic and migratory birds and thus it attracts a number of birdwatchers and nature photographers. 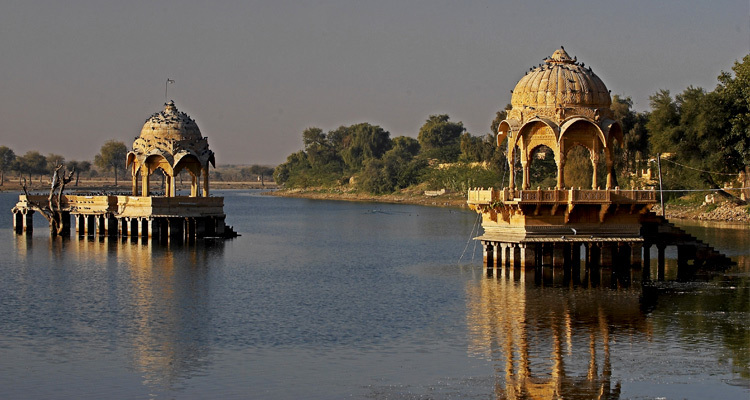 Shallow ghats, intricately carved cenotaphs and delightful gardens around this reservoir add to its splendid beauty, and are also one of the main reasons; the lakeside has become one of the popular picnic spots in Jaisalmer. 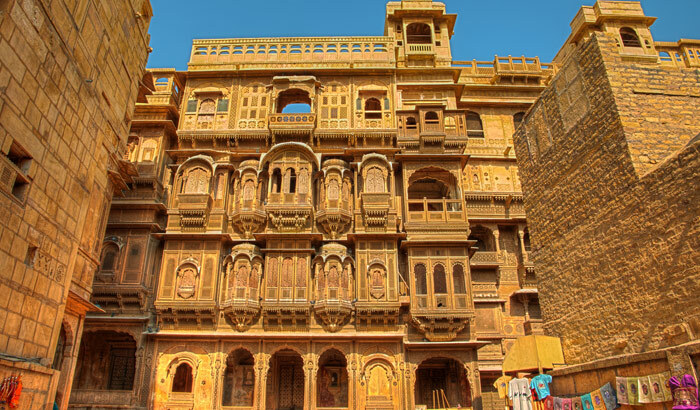 This haveli is one of the popular tourist attractions in Jaisalmer. 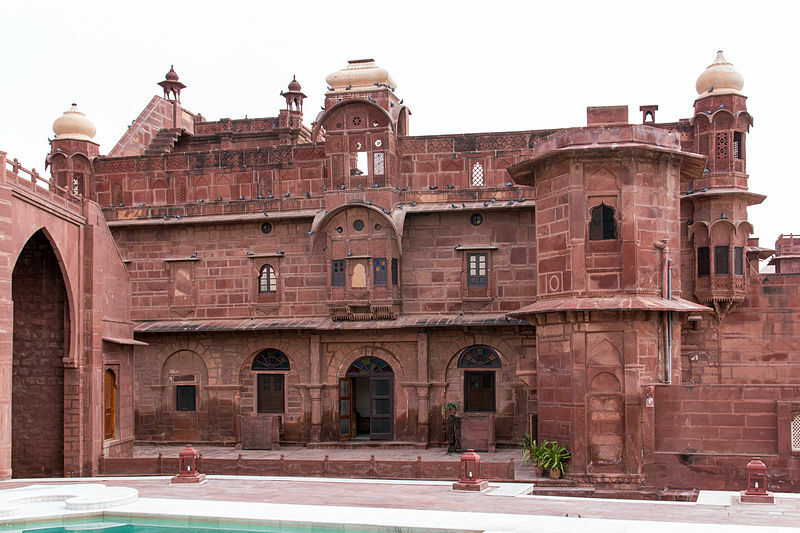 Salim Singh-ki Haveli is built on an older structure. This building was constructed during the early part of the eighteenth century. 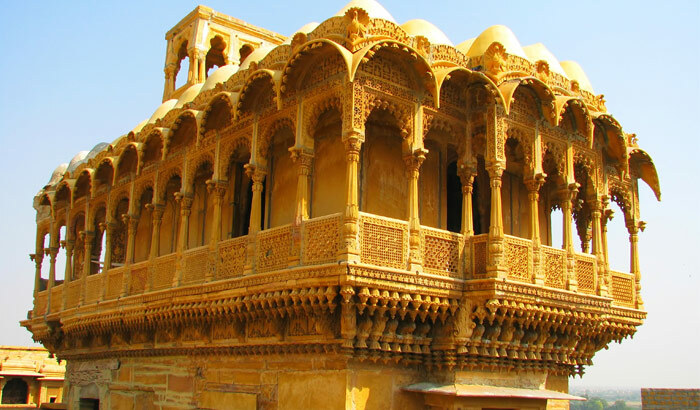 It was the residence of the Mehta family, one of the influential families in Jaisalmer during the early 18th century. Salim Singh, the then Prime Minister of Jaisalmer commissioned the building of this haveli. Having a unique architectural identity, the haveli’s roof is based on the peacock’s physical form and it lies within the vicinity of the Jaisalmer fort. In the background you can see high hills overlooking the mansion. It is believed that two extra floors were built in this building, but was apparently disapproved by the Maharaja and were eventually eradicated down. But there seems to be no indication that these floors existed. The gateways of this building are flanked by a pair of tuskers. Even though the tuskers are made of sandstone, the perfection of their size, shape and carving can make you believe them to be real! Located within the vicinity of the Kuldhara village, the Khaba Fort is an abandoned structure that is yet another eerie place in Jaisalmer. This fort holds great potential for photography enthusiasts and is one of the best places to visit in Jaisalmer to click amazing snapshots. 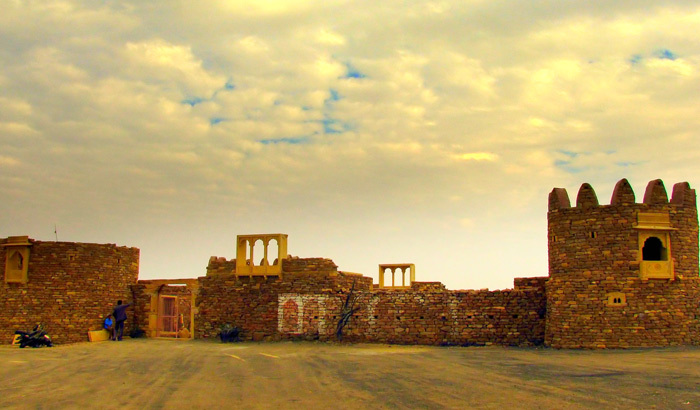 The surroundings of the fort are intriguing enough to let you have a chilling experience! This fort was inhabited by the Paliwal Brahmins, and the reason behind this desertion is not entirely known till date. It is believed that when the Paliwal Brahmins deserted the village, they deserted this fort too. When you are at the fort, you get amazing panoramic views of the village. Upon strolling inside the fort, you can experience the old world charm from the remnants of the structure. There is also a museum here that houses rare artefacts dating back to several centuries. Now this place and the surrounding regions are rarely visited by the locals who believe that this place is a cursed one. 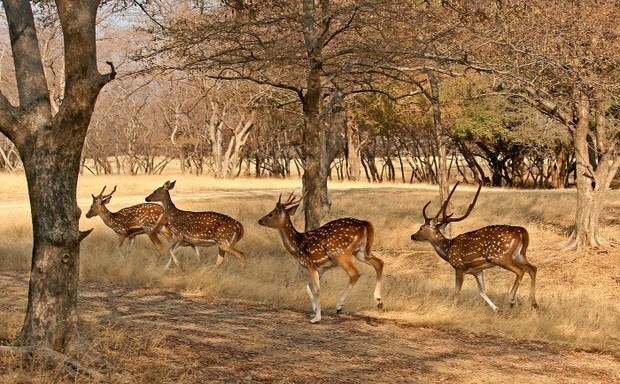 A visit to the Desert National Park will give a better understanding of how the plants and animals have survived the aridness of the Thar Desert. Displaying the unique range and collection of different species of flora and fauna, this museum attracts the nature enthusiasts and the botanists to a large extent. The terrain of this forest is multifaceted with craggy rock surfaces interspersed between the vegetation. The animals you can see here are the wolf, chinkara, blackbuck and desert cat. Considerable number of sand-grouses can also be seen near the water holes. During the mornings, you can witness the abundant activity of early birds such as the grey partridge for instance. The park is known to be the abode of the Great Indian Bustard, the state-bird of Rajasthan. The national park is located as a part of the Sudashri forest. The national park houses animals and birds that thrive in the desert. Fort Pokaran; the fourteenth-century bastion otherwise called "Balagarh" remains as a paragon in the midst of the Thar Desert. This landmark is the head post of The Chief of Mighty Champawats (the family of Rathores) has to its past distinguished title appended the prestigious honor "Pradhan" ( The Premier Noble ) to perceive each Thakur of Pokaran as of the main honor in The Darbar (the court) of the state Marwar-Jodhpur. It has become one of the most famous places to visit in Jaisalmer and has attracted millions of visitors in the recent years. Tazia Tower of Jaisalmer can certainly be considered to be one of the major tourist attractions on your Jaisalmer tour. If you are fond of the Rajputana architectures scattered in the city, Tazia tower will come as a welcome break to you. It is situated in the excellent 'Badal Palace' complex located near Amar Sagar Gate. These were once the homes of the former royal family. The Tazia tower is a 5-storied structure where each story has significance in its own. On each floor there is a balcony that is famous for their individual designs. This tower was built by Muslim craftsmen and is based on the shape of Tazia; which is actually the replica of Mausoleum of various Imams. The construction is made of wood, thermocol and coloured papers. The architects gifted it to the then royal patrons to honour them with love and respect.